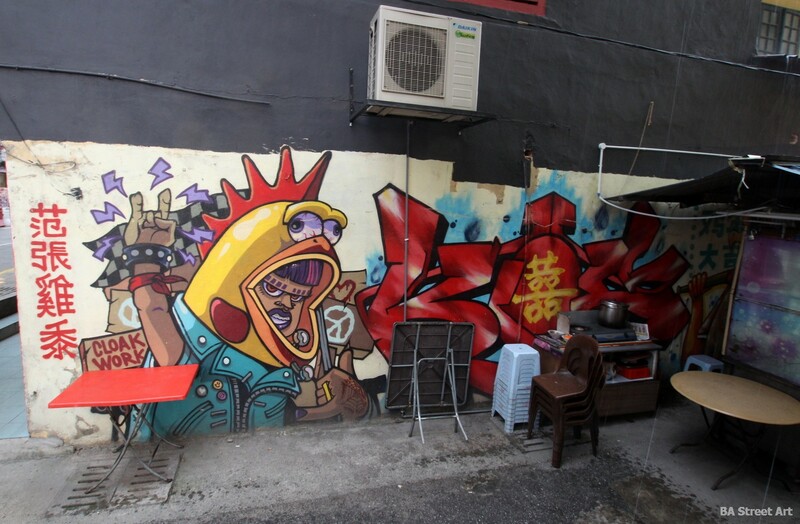 The sad news that Ernest Zacharevic’s fantastic installation ‘Rage against the Machine’ in Kuala Lumpur, Malaysia has been destroyed, inspired this blog post about street art and graffiti in the Malaysian capital. Photos by Matt Fox-Tucker of Buenos Aires Street Art. 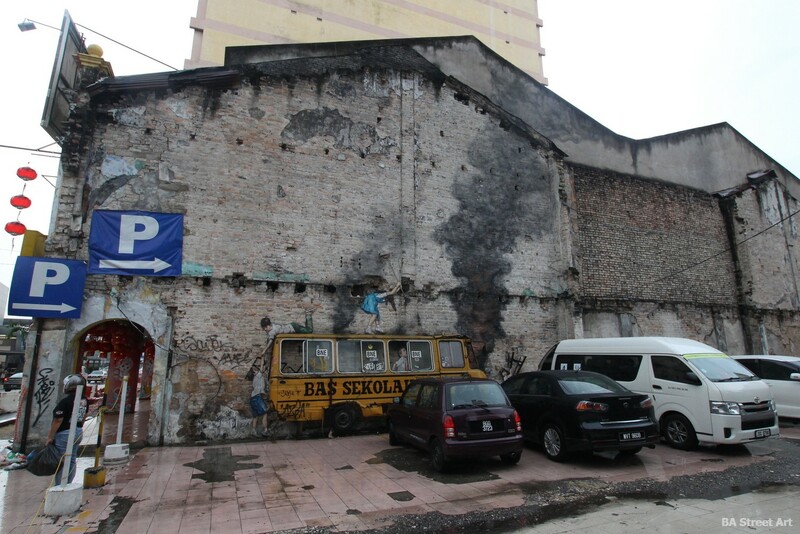 He added: “The intent was to create a work on the protest path in Kuala Lumpur, one of the last heritage locations. Despite the physical relationship of the work and the issue in Malaysia, ‘Rage against the Machine’ points more broadly to a global wave of social consciousness.” I’m not sure why the installation was destroyed, most likely the car park was being sold or built upon. Of course street art isn’t meant to last for ever. Anyhow, here are some photos I took of it while I was in KL a few months ago. Maybe you were lucky enough to purchase one of Ernest’s limited edition prints of the work that was on sale this week! 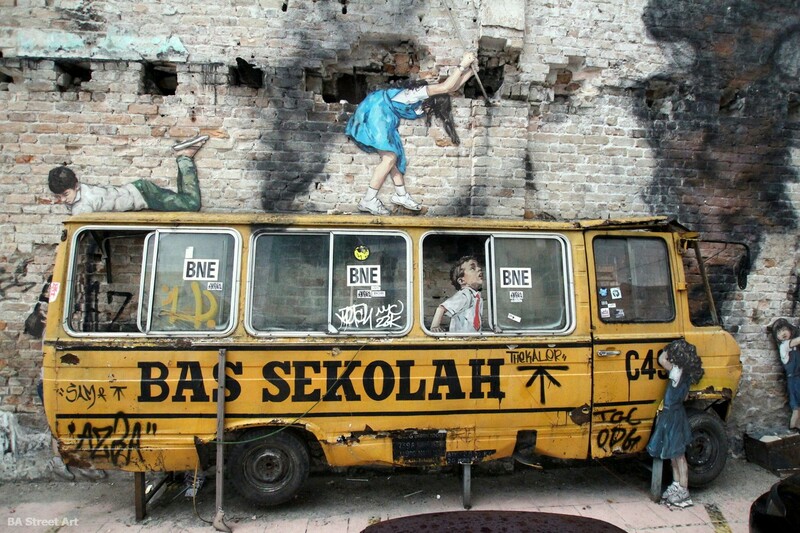 Another great artwork by Ernest Zacharevic can be found in a car park in KL next to the Wisma Allianz building. This one is still there, at least when this blog post was published. 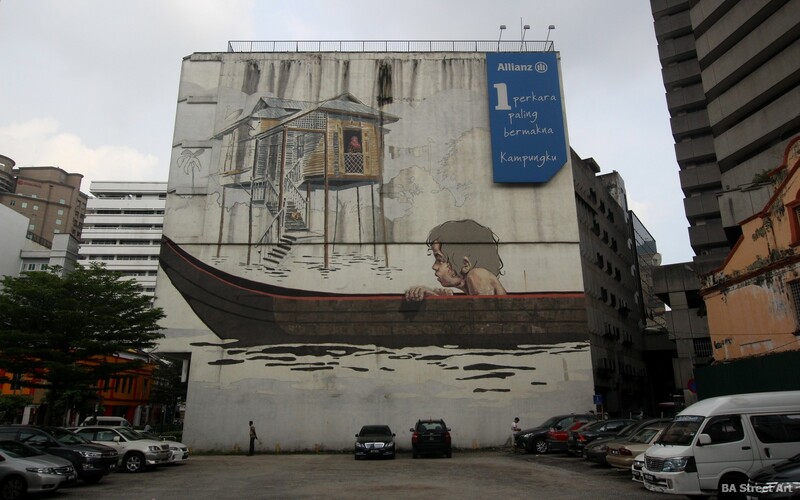 The large scale mural features a boy sitting in a sampan (canoe) sailing past a kampung (village) with houses on stilts. 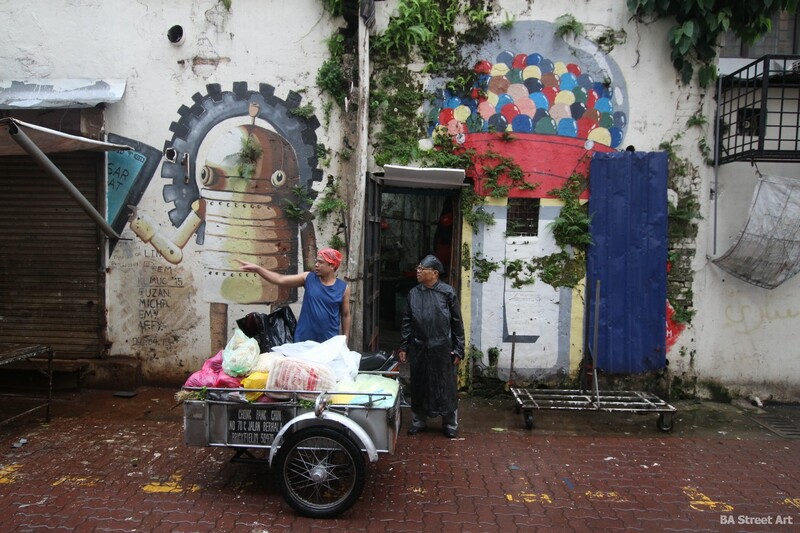 I met Ernest and saw him at work in 2015 while organising some mural projects for Argentine street artist Martin Ron in Penang, Malaysia. 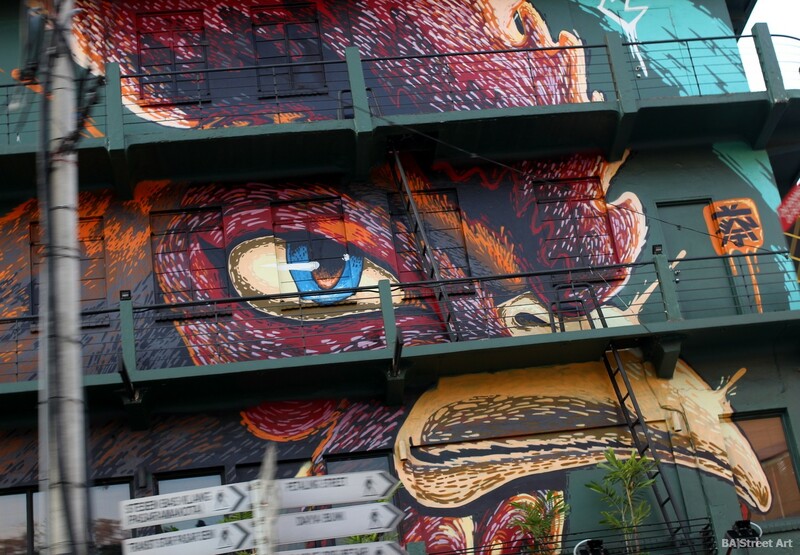 Hin Bus Depot arranged for the pair to paint a mural together in George Town. See story here. 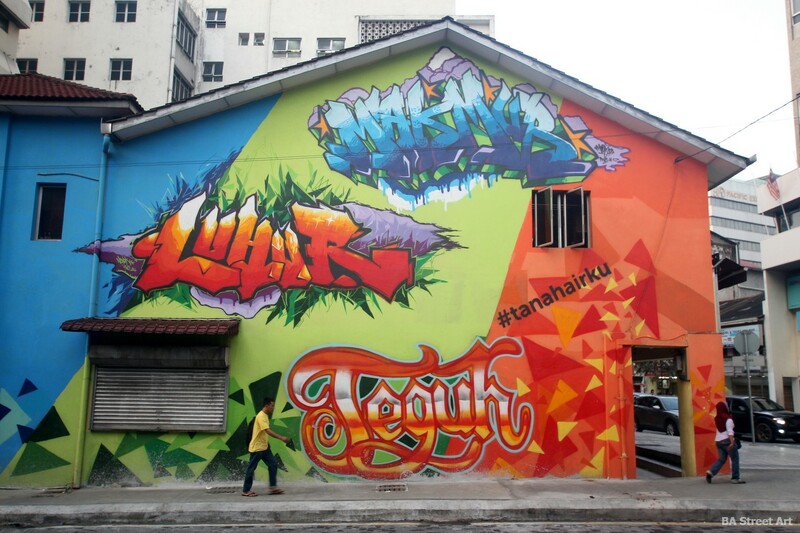 One of the biggest urban art projects in KL in the last few years was Tanahairku Street Art project sponsored by Petronas that saw 14 street artists and graffiti artists paint six murals around the city to coincide with Malaysia’s Independence Day on 31st August 2014. Tanahairku means ‘My homeland’. 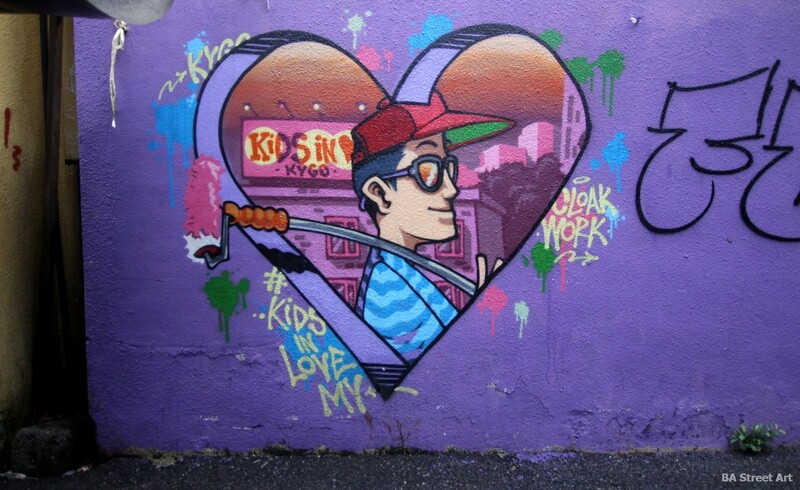 Kenji teamed up with Cloak Work for this collaboration named Hipster Boy & Kampung Boy along Jalan Raja Chulan. The artwork depicts two boys – one from the city and one from the country -playing with a kite painted with the Malaysian flag. The mural symbolises unity and the connection between people from different communities and backgrounds. 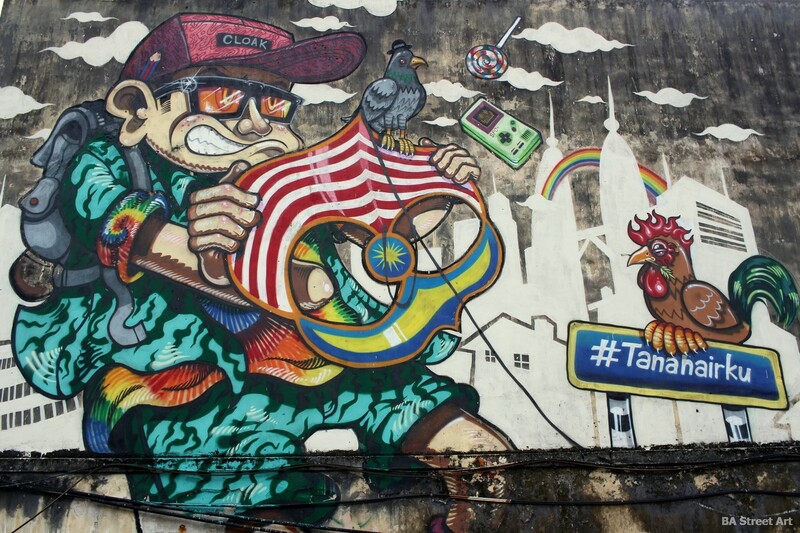 Another mural that formed part of the Tanahairku street art project in 2014. 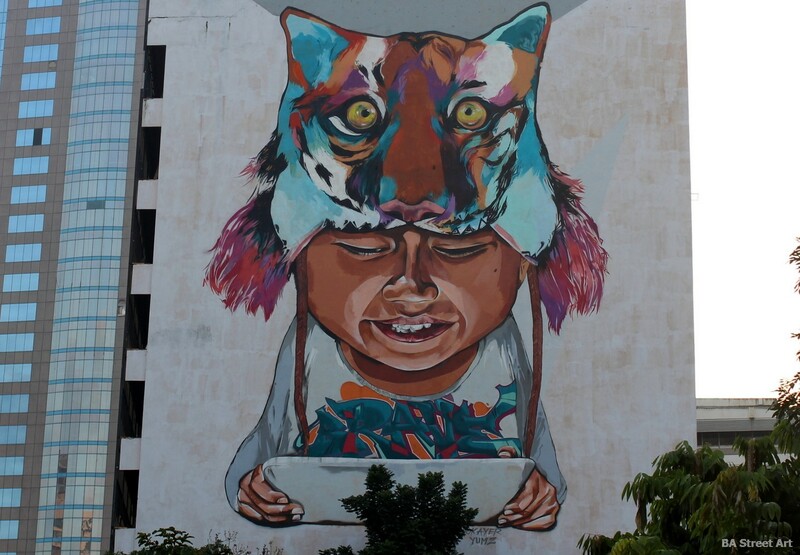 The huge artwork shows a boy with a tiger hat holding a tablet. 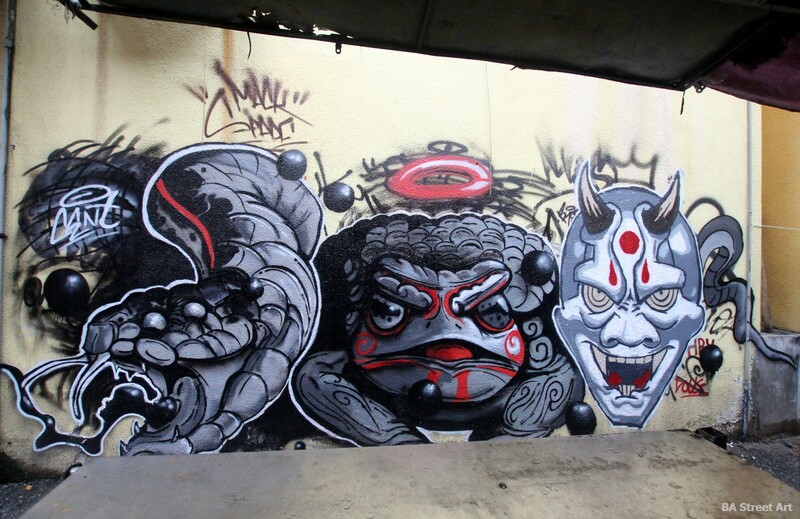 The tiger represents Malaysia and the artwork was painted by Anokayer and Yumz from Medium Touch crew. 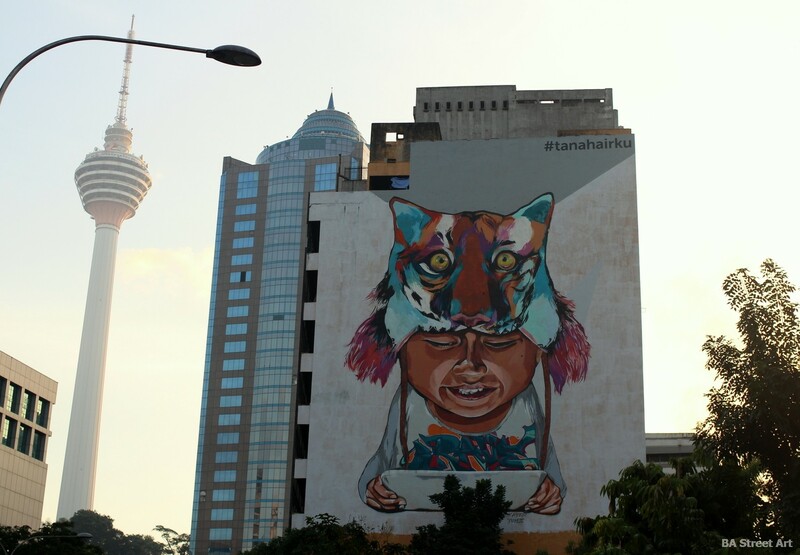 This mural has been painted on the side of an 11-storey building located along Jalan Raja Chulan close to Menara Maybank. In this photograph, you can see the KL Tower in the background. Also for the Tanahairku Street Art project, Phiberwryte Connection painted this design on the facade of a Chinese restaurant in central KL. The artists included the three words “Makmur, Luhur and Teguh” in graffiti-style lettering representing the energy of youth. 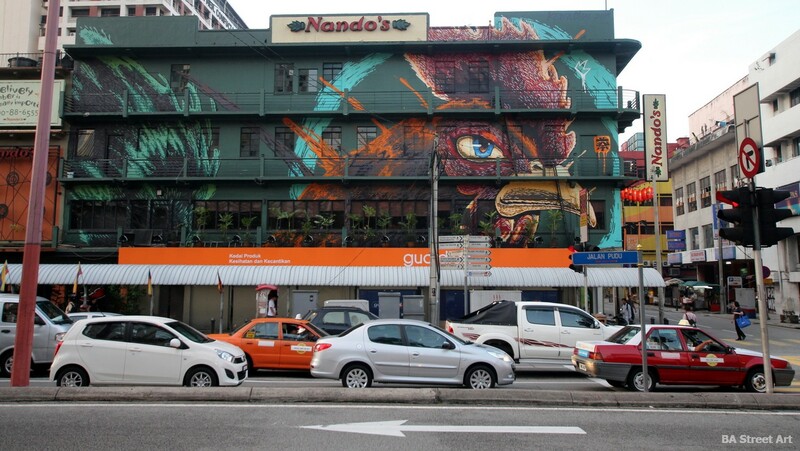 Malaysian street artist Kenji Chai was commissioned to paint this giant fighting cockerel on the side of Nando’s restaurant KL on Jalan Sultan. It’s one of the city’s best known murals. Kenji is well known for his brightly coloured animals and cartoon characters. Chinatown is a good district to find graffiti and murals in its the alleyways. The shutters of this store had the message “Spray for Chinatown”. 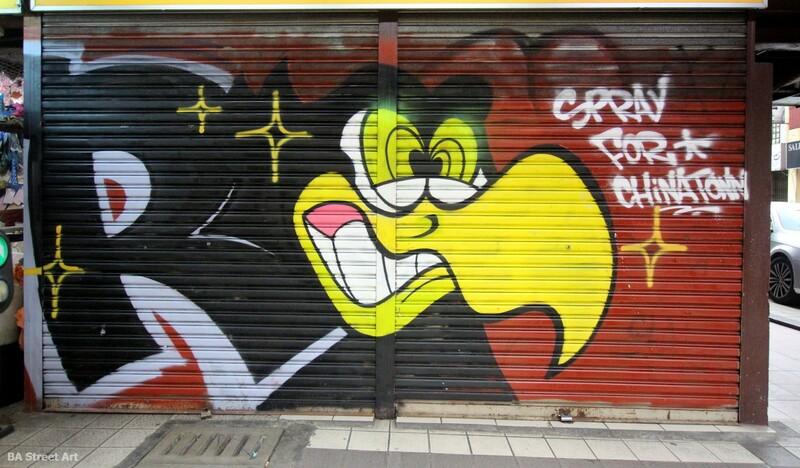 This cartoon character wearing a cockerel suit by Cloak Work and heart artwork were painted outside a tea shop in Chinatown. 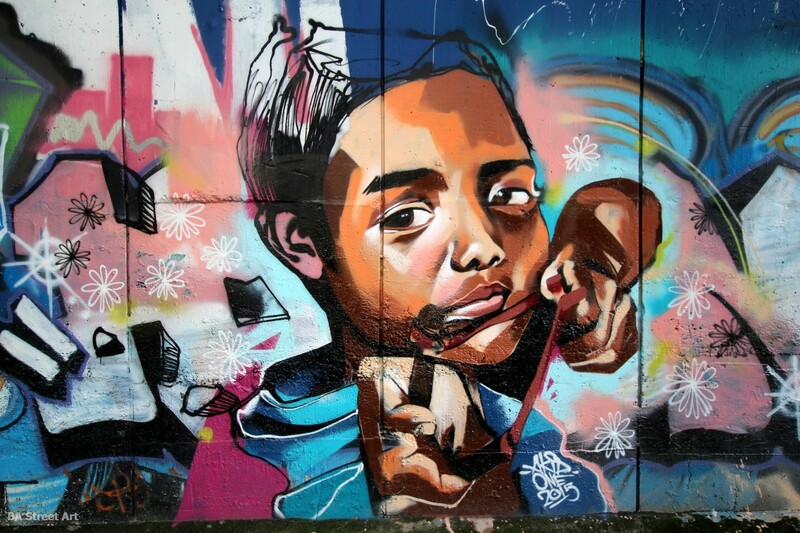 Akid One from the Medium Touch crew painted this boy with catapult in 2015 it can be found along the Klang River that is also a good place to check out some old school graffiti. 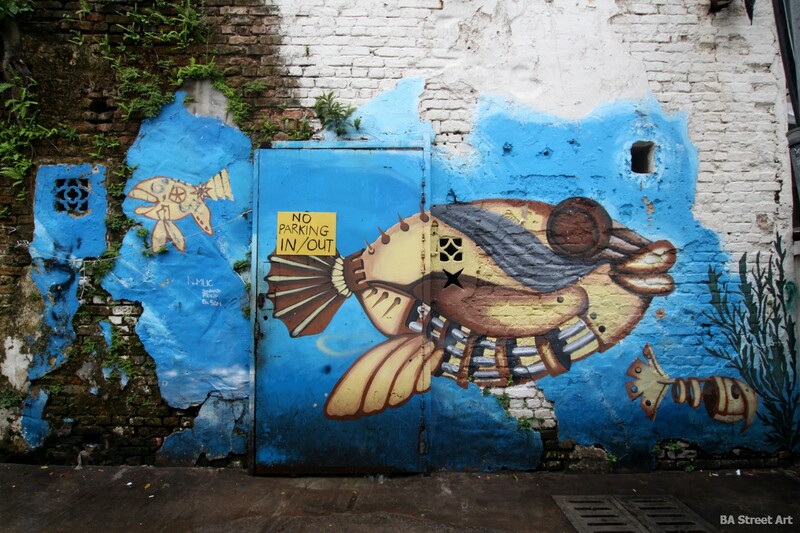 Check out our post about more street art in Malaysia including more murals by Ernest Zacharevic in George Town, Penang here.